MIAMI, FL — At its recent Mid-Winter Conference in Miami, FL, the National Association of Real Estate Brokers (NAREB) signed a groundbreaking Memorandum of Understanding (MOU) with United Security Financial (USF), a minority-owned mortgage company headquartered in Salt Lake City, Utah to make down payment assistance more broadly available to Black American home buyers. 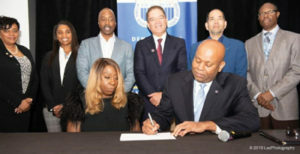 The two organizations announced that they have obtained a commitment of $50 million in down payment assistance funds from LBC Funding, LLC to assist in the expansion of homeownership for low-to-moderate income purchasers. “NAREB welcomes the collaboration with United Security Financial. Latest official homeownership rates issued by the U.S. Census Bureau report that Black homeownership at 41.7% lags far behind the Non-Hispanic White homeownership rate of 73.1%. That nearly 30% gap represents a significant loss of economic security and wealth building opportunity for Black Americans. NAREB’s goal is to build Black wealth through homeownership. That’s why NAREB continues to forge ahead with its aggressive 2 Million New Black Homeowners in 5 Years (2Mn5) program,” said Jeffrey Hicks, president of the National Association of Real Estate Brokers (NAREB) founded 72 years ago to ensure “Democracy in Housing” for Black Americans. The down payment assistance funds will be used in conjunction with first mortgage home purchase loans made by USF to NAREB Realists’ clients over the next 12 months. The commitment represents an important step in meeting the 2Mn5 goal. “The new partnership with USF allows Black Americans to overcome one less barrier in their quest to become home owners,” Hicks added.